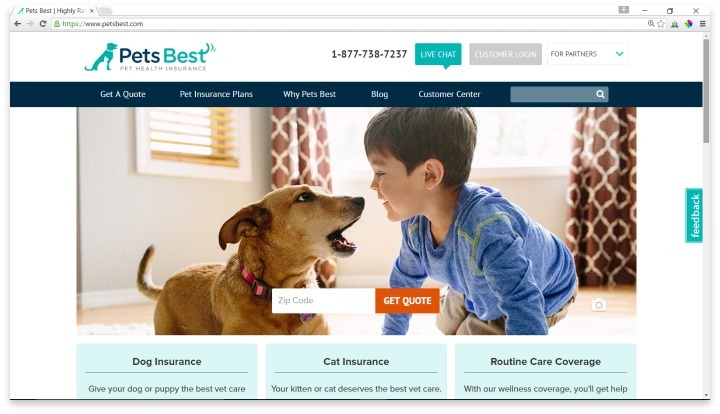 Pets Best is a pet insurance company that was founded in 2005. They offer both emergency medical services coverage as well as routine care coverage. Their mission is to help ensure that pet owners have the resources they need so that economic euthanasia is never a choice that they must make. Pets Best, as well as its founded, have been awarded multiple honors throughout the lifetime of the business; they were also the first pet insurance company that created a totally electronic claim filing and payment process in 2011. Pets Best is a good example of a traditional pet insurance company, because it offers coverage for medical emergencies, regular wellness exams, pregnancies, chronic conditions, and even certain alternative therapies such as acupuncture or chiropractic services. They offer specialty plans that only include emergency coverage, which is great peace of mind for pet owners who are financially able to cover the regular wellness exams, but want to be sure that major emergencies don’t put a dent in their savings accounts. These plans can be used to cover just accidents, just illnesses such as cancer, just pregnancy, or just common illnesses for your specific pet type. Their plans all come with multiple options for copay and deductible amounts, with fluctuating monthly premiums depending upon what you choose to pay in these two areas. While this is a common practice in pet insurance, Pets Best goes a step further by allowing you to choose to pay no deductible or copay at all, accepting a higher monthly premium but no additional costs. Pets Best does come with both annual and lifetime limits on coverage. They are quite high, but it’s still a concern for some pet owners. Where Pets Best falls below the top pet insurance companies, however, is in its online reputation. While their services and practices seem very good at first glance, there is a growing majority of users who are rating the company at two stars or below across the Internet, claiming that payouts are very hard to get. Pets Best has a strict coverage waiting period policy, and any condition or injury that could have happened before the waiting period was up, even if diagnosis and treatment did not happen until well after the period, is routinely denied. Despite complaints that claim payouts are getting harder to come by, most reviews indicate that customer service is easy to get in touch with through their various channels. Pets Best also does not offer the variety of discounts that many other pet insurance companies offer. They do offer a small discount for insuring multiple pets, but there are no discounts for paying annually or being a part of any organization. Pets Best offers coverage for medical emergencies, regular wellness exams, pregnancies, chronic conditions, and even certain alternative therapies such as acupuncture or chiropractic services. At first glance, Pets Best is an excellent option simply because they offer so many easy-to-understand choices for insuring your pets. If you will have your pet for many years to come, and simply want to know that you will be able to cover emergencies down the road, Pets Best may be the best solution. However, if you are seeking pet insurance because a single medical emergency would make it impossible for your budget to stay afloat, or because your pet exhibits signs of needing long-term health care, you may be better off going with a more trustworthy company that won’t fight you on paying out claims. Have you had an experience with this company? Please share your Pets Best reviews below.